Fairphone has received enough orders to start production on what it says is a smartphone that will be built according to ethical standards, designed and produced with minimal harm to people and the planet. The Amsterdam-based company reached its goal of 5,000 pre-orders on Tuesday, which means that Fairphone supporters will probably get their devices in October, operations manager Laura Gerritsen said Wednesday. The Fairphone project aims to manufacture a smartphone that, ideally, uses no minerals from conflict zones, is entirely recyclable and manufactured under good labor conditions, the company said. The company plans to use an open design, and make transparent what a Fairphone buyer's money is used for, it said. The design calls for a dual-SIM phone that has a replaceable battery, a 1.3-megapixel front-facing camera and an 8-megapixel rear-facing camera, a 4.3-inch touchscreen covered with Dragontail glass and a quad-core Mediatek processor. The phone -- called Fairphone, like the company name -- will run Android 4.2 Jelly Bean with an interface developed by Kwame. The project started in 2010 as a campaign against the use of minerals from conflict areas, but the team thought it was better to actually develop a "fair," or ethically built, phone than start another petition, Gerritsen said. Fairphone has been funded by several NGOs and received €400,000 (US$522,480) in private funding to cover operations up to when its pre-order campaign ended. It has also received support from several companies, including Vodafone and Dutch telecom provider KPN. While the company acknowledges that the first version of the Fairphone won't be 100 percent fair, as it defines the term, it did its best to come up with a phone that is as ethically made as possible. If sales are strong, the team wants to make a second version that has more conflict-free minerals and is more ecologically sustainable, Gerritsen said. For now, Fairphone has sourced conflict-free tin and tantalum, said Fairphone founder and CEO Bas van Abel. A smartphone usually uses about 30 minerals, of which three are typically sourced from conflict areas: tin, tantalum and tungsten, he said. At the moment there is no good system to make sure tungsten is conflict free, he said, adding that that is a goal for the next phone. 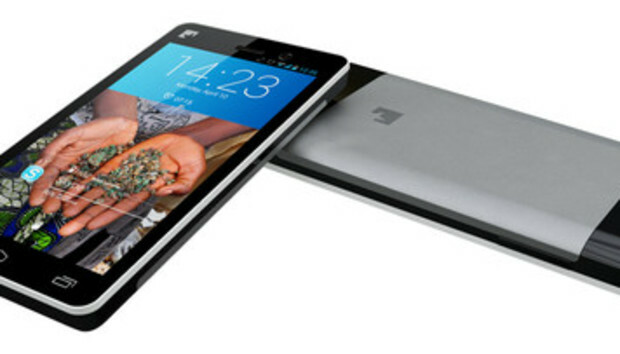 Other companies, including Nokia, also participate in the same conflict-free tin initiative as Fairphone, Van Abel noted. But Nokia can't specify which phones use the conflict-free tin, he said. "Because we are small we can fully control the chain," he said. Fairphone, however, is more an NGO than a phone manufacturer, Van Abel said. "We took the telephone as a means to understand the chain better," he said, adding that there were talks with Nokia about packaging methods that the Finnish phone maker developed. "They also do good things, we can use their good practices too," he said, noting that the Fairphone project is an initiative that aims to inspire the industry. The company hopes to sell 20,000 units of its first phone. Fairphone would also rather use alternative open-source software, like the Ubuntu OS, which is not linked to big commercial companies. There have been talks with Ubuntu and Firefox, but the OSes developed by those companies were not ready to implement immediately, Gerritsen said. The Fairphone is fully rootable though, which means that users are free to run the OS of their choice on the phone, she added. The phone will be manufactured in China, known for factories with poor working conditions. "We could have chosen to manufacture the phone somewhere in Austria under good conditions ... but we want to be there where we can improve things," Gerritsen said. That also means minerals used in the phone are sourced from the Democratic Republic of Congo, where the sale of minerals often benefits armed groups. Fairphone joined initiatives in Congo that guarantee the minerals they use don't fund illegal armed forces, the company said on its website. The Fairphone will be sold for €325 in the Netherlands, including taxes, and is available for pre-order via the company's website. Before taxes the phone is priced at €268,60, but prices may vary by country. Currently Fairphone only has plans to ship to addresses in Europe, including France, Germany, the U.K., Ireland, Italy, Poland and Spain.